If you’ve visited the oral hygiene aisle at your local pharmacy or grocery store recently, you’ve likely seen the numerous products that promise to brighten your smile. In fact, most of the patients who visit our office to ask about teeth whitening have already tried one or more over the counter teeth whitening products with little to no success. 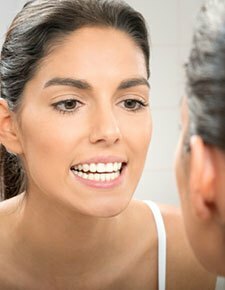 Before you waste your time on these one size fits all teeth whitening solutions, we encourage you to call Friendswood Dental Group to schedule a cosmetic dentistry consultation. James T. Sierra, DDS, FAGD will create a personalized teeth whitening plan that directly addresses the underlying cause of dental discoloration, leaving you with a brilliant white smile. 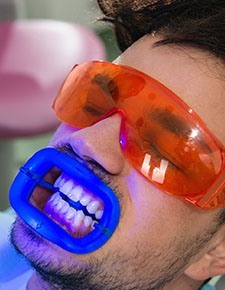 For patients who want to brighten their smiles quickly, in-office teeth whitening is the best option. The process is simple. 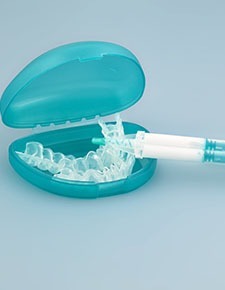 We begin by isolating the teeth and protecting the lips and soft tissue. Then, we apply a coating of whitening gel to the surfaces of teeth. The whitener remains active for about 20 minutes at a time. Then, we remove the whitening gel to check the process, and we reapply as necessary. Most patients achieve their desired results in just about an hour of treatment. If you prefer to brighten your smile more gradually or suffer with sensitive teeth and gums, a professional take-home whitening plan may be preferable. Unlike store bought whitening kits that use low doses of whitener and one size fits all application methods, our professional take-home whitening kits are customized to meet the individual patient needs. We will provide you with a professional dosage of whitening gel and a custom crafted application tray. Then, you can apply the whitening gel for thirty minutes a day for two weeks.